I'm a huge David Gilmour fan. At home and on larger stages I use my Hiwatt with a rotary speaker to give that liquidy Gilmour tone. In smaller venues and when travelling this simply isn't possible. In such cases I put this little baby on my board with the level just above half way I can get a convincing rotary style tone that's "almost there-almost gone"....just what I need. It won't give you the deep warm nirvana-esque chorus of the EHX small clone, but instead gives a rather thin sound due to the modulation's emphasis on higher frequencies. I find it gives me a good Joy Division tone, but that's it. 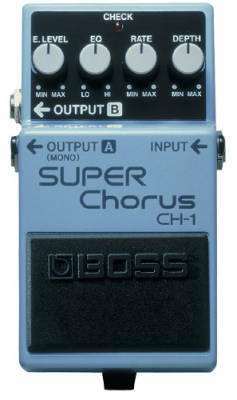 Does an acceptable "subtle chorus", but there's better pedals for that out there. It is too limited for the price, but does that bright lo-fi chorus nicely. Typical good boss build quality and ok quality buffer.